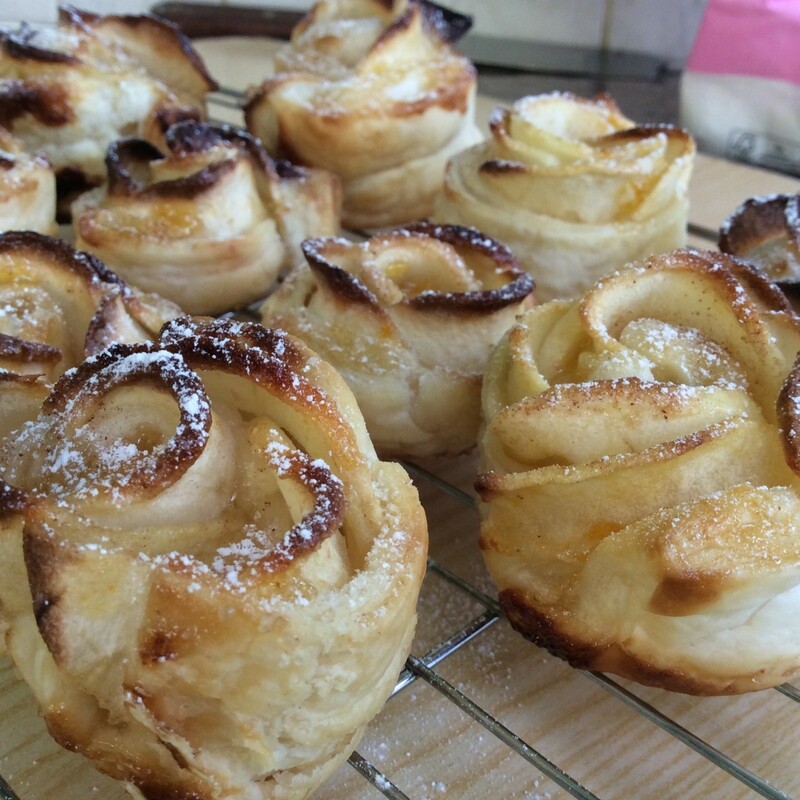 I’ve been meaning to try making these for ages and they didn’t disappoint when I finally got round to them at the weekend. 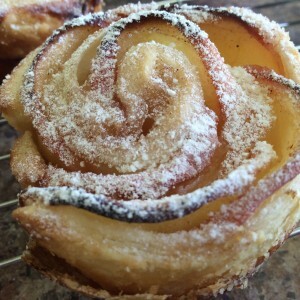 They make a lovely little sweet bite with a cup of coffee, or an equally good dessert if you serve two or three warm with a lovely big scoop of clotted cream or vanilla ice cream. As usual, I wasn’t really paying attention to amounts, so these are a bit of a ‘think of a number’ recipe – you can make as few or as many as you have ingredients for. Roll out the pastry on a lightly floured board until fairly thin – even a ready rolled sheet will need rolling out slightly. 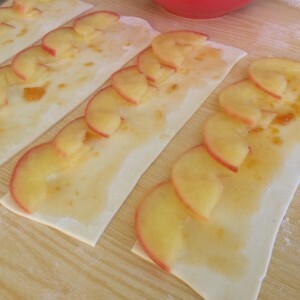 Cut strips of pastry approximately 6 X 20 cm. Cut the apples in half top to bottom and carefully remove the core, trying not to cut into the apple flesh, then slice thinly horizontally round the apple to create arched shapes. 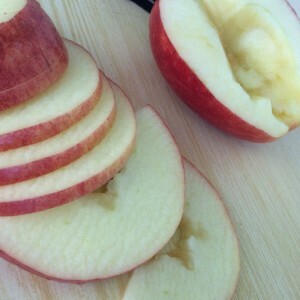 Place the apple slices in a saucepan with a squeeze of lemon juice, cover with cold water and bring to the boil. Drain and run under cold water to cool. 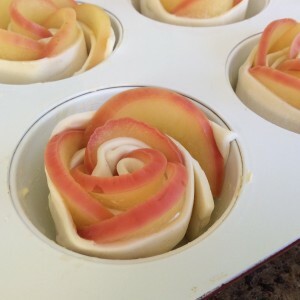 The apple slices should now be flexible. (This can also be achieved by microwaving the apples with the water & lemon juice for 5 minutes). Place 2 tbsp apricot jam and 2 tbsp water into a small saucepan and heat until runny, stir well to combine (This can also be done in a microwave). 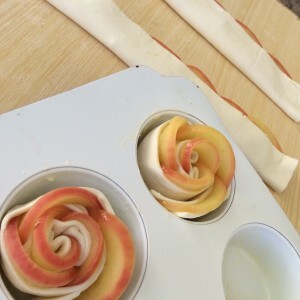 Brush each pastry strip with apricot jam and place apple slices along one long edge, with approximately half each slice hanging over the edge of the pastry. Overlap the slices slightly. Fold each strip of pastry over the flesh side of the apples so that the pastry encloses the apples but the peel edges are still showing. Starting at the short end of each roll, carefully roll each strip up, gently easing the slices against the pastry with one hand so that they don’t slide out. Pop each rose into the muffin tin. Allow to cool for a couple of moments then remove from the tin and place on a wire rack to cool completely.